As it continues to develop its range of cable routing tools, C.K explains how its new range of spiraFLEX draw tapes offer a host of benefits to users. Following the successful launch of its range of next generation C.K MightyRods PRO cable rods, C.K continues to develop its range of cable routing tools, boasting high quality and efficiency. 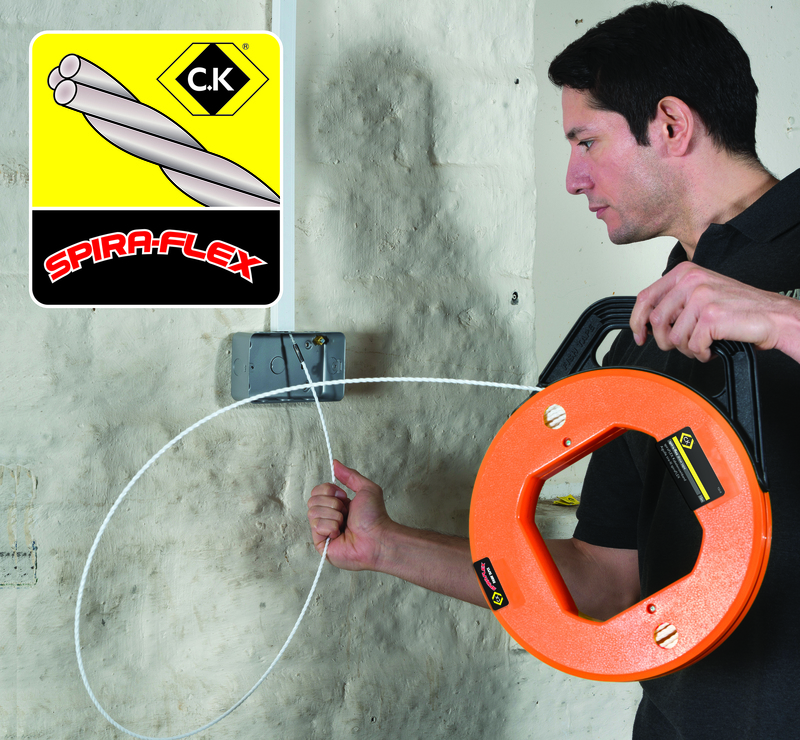 The launch of the new and innovative range of C.K spiraFLEX draw tapes marks a significant advancement in draw tape technology, making them the perfect solution for the smooth routing of cables through conduit, trunking, ducts and wall cavities. The newly developed spiraFLEX draw tapes offer numerous benefits when it comes to providing the answer to hassle-free cable routing. The super flexible and immensely tough 4mm Ø spiraFLEX draw tape offers a major improvement on standard nylon and steel draw tapes, which are often prone to twisting and kinking. In addition, the unique helical profile of spiraFLEX and advanced Polyethylene Terephthalate (PET) material greatly reduce friction, kinking and coiling, to ensure longer and smoother runs and enable the user to complete the task quickly and easily. Obstructed runs are also effortlessly navigated with C.K spiraFLEX draw tapes, which are supplied with a high tensile steel wire flexi lead to allow much smoother runs. The benefits don’t stop there either and, for added convenience, the C.K spiraFLEX draw tapes are compatible with all C.K MightyRods accessories, including the LED Torch, Magnet, In-line Swivel and Hook. A high quality product, offering a multitude of benefits to the end-user, the new C.K spiraFLEX draw tape range is set to become a popular choice with anyone looking for a superior cable routing solution. Prices for the C.K spiraFLEX draw tape range start from £46.36 (ex-VAT).